Laura Lake lives in Paris with her grandmother. Laura wants to stay there to take care of the stylish woman who always has the best advice, but when she gets an opportunity to work for a magazine in London Laura's grandmother encourages her granddaughter to go. Society is a glamour magazine and Laura's first assignment is to cover a series of society weddings. This might be her big break, which she needs to become a paid journalist instead of an unpaid intern. While nothing is as it seems and things never go according to plan Laura tries to keep her head above water. Even if that means sleeping in a fashion cupboard, having no money to buy food and competing against her arch enemy. Will Laura be able to make her dreams come true? Laura Lake and the Hipster Weddings is a fantastic funny story. I loved Wendy Holden's humoristic tone of voice. Laura is smart, creative and daring. She's determined to get a paid position at the magazine she's working for. That means interacting with socialites, chasing thieves and going to the weirdest kind of weddings without being invited by the bride or groom. The competition is stiff and not sympathetic enough to play fair. There's a lot going on in Laura's life and all of it is fascinating, entertaining and eccentric. She needs to be intelligent and attentive to survive, which is something I liked very much. Wendy Holden has a fabulous classy writing style. She combines it with funny remarks and witty dialogue. I immediately loved her dynamic and sparkling descriptions of her characters and the situations they find themselves in. Laura Lake is a marvelous main character. She's always in the right place at the right time and her observation skills combined with inventiveness are making sure she acts exactly when and how she should. That regularly made me grin. Laura goes from complex situation to really complex situation and I couldn't read fast enough to find out what her next adventure would be. Laura Lake and the Hipster Weddings is a comic and gripping story with plenty of surprising elements. Laura Lake's enchanting personality makes it easy to like her and her story. I loved how she enters the world of glitter and glamour like she's always belonged there and was amazed by how wonderfully lighthearted and bizarre it all felt. I read the story in one sitting and enjoyed every single page. 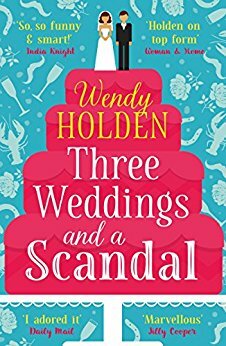 Wendy Holden's engaging writing combined with plenty of amusement made me absolutely love this book. Laura Lake works as the deputy editor of Society, a glossy magazine. Her job doesn't excite her very much any longer, because her colleagues are getting all the nice extras and exciting trips and Laura stays behind her desk. To make Laura happy her boss sends her to Coconut Cay, a beautiful Caribbean holiday destination owned by a billionaire businessman. Laura's supposed to be there for an exclusive, but when she arrives other journalists are waiting for the exact same thing. However, that isn't the only thing that's amiss. Will Laura's holiday in paradise be as nice as she expected it to be? Laura Lake and the Luxury Press Trip is a fun short story about the fabulous Laura Lake. She's bold, courageous and incredibly fierce. I love her outspoken personality and her way to make things happen if she wants them to. She's a fantastic main character because of who she is. She makes her life interesting and I enjoyed reading about her adventures again very much. Wendy Holden has a great sense of humor. Her writing has a nice easy flow and I really like the original twists and turns she comes up with. She keeps surprising me with the direction her stories are taking and that makes them a joy to read. 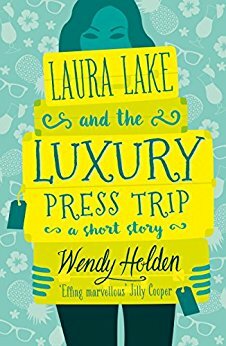 Laura Lake and the Luxury Press Trip is an entertaining short story with a hilarious unexpected ending. If you're a fan of clever humoristic stories with plenty of glitter and some glamour you will love the Laura Lake series. I'd advise you to read the stories in their correct order. Three Weddings and a Scandal was previously published as Laura Lake and the Hipster Weddings. One very lucky reader of With Love for Books will receive a paperback copy of Three Weddings and a Scandal. The Laura Lake series sounds like wonderful, witty books that will have me laughing out loud. The Laura Lake series sounds like something I would love to read! The review was awesome! Thanks! this book looks like a great read, and I know the perfect person who would love this for Christmas! That would be me!!!! I love Wendy's books. I would love to read this! It looks like another great book! It sounds really interesting book! I love clever humoristic stories and would love to read it. Oh this sounds so good! I love the romance books with comedy in them! Wendy Holden is a new author for me. I cannot wait to see what else she has written! I like stories that make me laugh. I think these books will do that. Do love Wendy Holden's books. I can read them again and again and find myself laughing at the same moments. They are like visiting old friends.